Given the disparity to the other big names in the space AKER has become a true value proposition. Miami, FL – November 20, 2018 (EmergingGrowth.com NewsWire) — EmergingGrowth.com, a leading independent small cap media portal with an extensive history of providing unparalleled content for the Emerging Growth markets and companies, reports on Akers Bioscience (NASDAQ: AKER). As recent as a couple of months ago the cannabis sector was on fire with stock’s like Canopy Growth (NYSE: CGC), Cronos Group (NASDAQ: CRON), Tilray (NASDAQ: TLRY), Aurora Cannabis (NYSE: ACB), New Age Beverages (NASDAQ: NBEV), and GWP pharma (NASDAQ: GWPH) shooting to new heights then the air came out of the sector on good news. The legalization of Cannabis in Canada was a big win for the entire sector. It created hope that legislators in the USA would follow suit. There are signs that things are tilting in favor of federal legalization. In September the Drug Enforcement Agency (DEA) moved to take CBD with THC content below .1% off of its Schedule 1 and has classified it as a Schedule 5 removing many barriers for legal financing. The Attorney General Jeff Sessions was seen as a big impediment toward the legalization of Marijuana. Before Session’s resignedon November 7, 2018 bipartisan Congressional leaders were quick to point out that 92% of Americans supportthe use of medical marijuana. This changing attitude is also being reflected in big board stocks. In 2017 $9 billion in marijuana sales were reported by the industry nationwide according to Tom Adams, managing director of BDS Analytics. These numbers don’t include California which opened in January 2018. Estimates are calling for $11 billion in sales nationwide for 2018 and expected to rise to $21 billionby 2021. The industry employed more than 121,000 people in 2017 and expected to reach 292,000 by 2021. 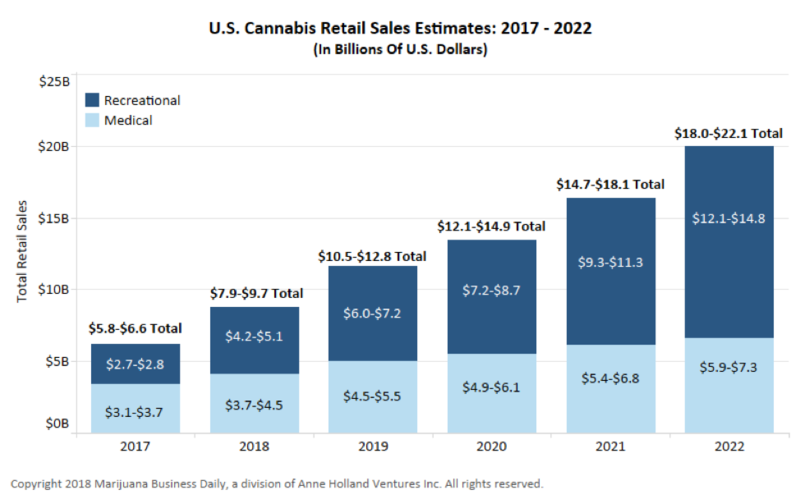 With this industry growth factor, trajectory, and viable path to legalization it’s easy to see how big business is going to want a piece of this big pie. Investors are beginning to understand the value of the Cannabis market and how it is becoming a land grab. The ones most likely to succeed are the ones with access to capital and that is where the NASDAQ valuation proposition comes into play. Well capitalizes stock under the scrutiny of the SEC are always going to win favor over stocks in the OTC world struggling to raise money. It is these stocks that will be used as vehicles to roll up smaller cannabis players in the space. Here is one mighty big value proposition that for all intensive purposes put a stake in the ground declaring its move into cannabis. The fate of the OTC cannabis stocks is based on the big players in the industry. 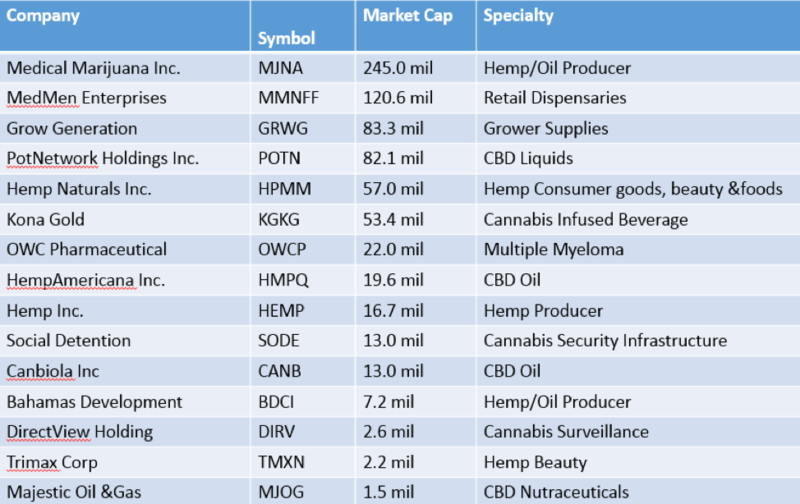 Most cannabis OTC stocks are undercapitalized but some are finding scraps of financing and executing on their business plan. Grow Generation (OTC: GRWG) is the wholesale supplier to the grower supplying everything from lights to fertilizer. Kona Gold (OTC: KGKG) had a premium bottle that contains a hemp energy drink. OWC Pharmaceuticals (OTC: OWCP) and Corbus Pharmaceuticals (NASDAQ: CRBP) are using cannabinoids to tackle the diseases of multiple myeloma and systemic Sclerosis. HempAmericana (OTC: HMPQ) and Cabiola (OTC: CANB) are trying to distinguish themselves as premium CBD oil producers. Direct View Holdings (OTC: DIRV) and Social Detention (OTC: SODE) are carving out niches in cannabis infrastructure. Trimax (OTC: TMXN) also known as Saavy Naturals has broke onto the scene with a line of hemp infused beauty products that have made it into Walmart. Bahamas Development (OTC: BDCI) is one of the most misunderstood stocks with a grow operation, edibles division, and CBD oil. They appear to be morphing into a cannabis holding company. Akers Bioscience (NASDAQ: AKER) was up over 100% is premarket yesterday based on the update that they are going to evaluate strategic alternatives. What is so interesting is that their current updateon strategic alternatives was first unveiled on November 7, 2018. In yesterday’s release they have “initiated a process to evaluate strategic alternatives to maximize shareholder value. This process will consider a range of potential strategic alternatives including, but not limited to business combinations, while simultaneously supporting the Company’s management and employees in the execution of the Company’s business activities.” The timing of the announcement and Sessions resignation along with the timing of the MJBizCon Trade Show from November 14 – 16 and the announcement that they “met with a number of companies in cannabis related industries at the MJBizCon” foretell a deal is in the works. They also engages a legal firm to advise them with the opportunities. The company is clearly exploring operations in cannabis and is doing everything by the book. Yesterday there was an enormous short squeeze on the news and investors rushed in. The stock stabilized at up around 70% and then at 2PM a hatchet article from negative storyteller Max Cherney who puts himself out to be a reporter for MarketWatch. His article Failing Biotech Company Mentions Pot Business, Stock Soars 70%is full of exaggerations and facts that mislead rather than connect into a coherent thesis. He mentions that the company has been sued by shareholders(page 29) and honestly what good company hasn’t has a lawsuit, but what he fails to mention is that when AKER has been sued no lead plaintiff came forward or they were not served. Max Cherney wants to imply that the company is dirty and will say anything to mislead investors. In the next sentence he said “the SEC has previously issued warnings about previous scams” insinuating AKER was warned by the SEC when in fact it has not been. We hope investors realize the old tactic of calling in a bear raid when the shorts are on the ropes. With a record 15 million shares traded yesterday and 12.47 mil shares issued and outstanding it doesn’t take a math genius to figure out the shorts have a very big problem. The reported short position as of 10/31/18 is 10.08 million but must be adjusted down to 1.26 million adjusted for the 8:1 stock split. In the month of November including Halloween the stock lost $2.55 or close to 67% of its market cap so it’s pretty clear that shorts had a lot to do with it and the short interest is multiples of that 1.26 million. Their game is to artificially push it below $1.00. The reason is clear if they can get that close then the company will have to face NASDAQ regarding the minimum listing requirement. The shorts only have 24 hours left to accomplish their goal. If not a massive short covering rally could ensue. Is Max the answer to the shorts prayer? Only time will tell if you believe these half-truths and shoddy research. Cannabis is an up and coming investment class and from the looks of it here to stay. Investors will gravitate toward quality blue chip names in the sector before speculating on the unproven ones. This massive inflow of funds is going to touch all cannabis related stocks including AKER. There appears to be a conviction to reinvent themselves as cannabis stock. Although we don’t know what AKER will ultimately morph into it seems reasonable to expect their first deal to be somewhat related to testing. The fact that AKER is looking at multiple business also gives rise to the idea that they might be the first to be considering a major rollup in the industry. If that were to happen they could be more valuable than some of the existing names because they would offer diversification to the investor. Given the disparity to the other big names in the space AKER has become a true value proposition.